When a post includes a plant or plants recommended in foraging courses, workshops or books the ‘wild foraging’ tag is highlighted. These posts include profiles on individual medicinal plants and general herbal based articles discussing a plant or plants. They are not specifically wild foraging posts. However, they provide an indication of plants for foraging. Some of the posts include a recipe which may be medicinal or culinary. Foraging is essentially searching, finding and harvesting from wild food resources. It is the safe identification of edible plants from nature. Food for free. Some collected plants, such as purslane and violet flowers, are for inclusion raw in wild salads. Others require some form of cooking or preparation. The Plantaginaceae is a family of 253 species, 250 are Plantago species. Plantago herbs are perennial with small flowers and generally parallel veins (Barker). Plantago is the scientific name for plantain. Common on bare ground and grassland either as P. lanceolata or major species. The wider leaved variety is major. The P. lanceolata species is more commonly known as ribwort. Mabey describes Plantago major as the broad-leaf or common variety while Plantago lanceolata he calls the long-leaved variety. Medical herbalists can, and do, use both of these species. A survivor of trampling. Hence, known to Native American Indians as ‘white man’s foot’. Where does it grow? Everywhere! Podlech advises the small seeds are spread by feet of animals and people. And we return to the white man’s foot! Distributed throughout Europe although it has spread worldwide. Barker tells us Plantago major grows on paths and roadsides, in town or country. Also found in gardens and waste grounds on disturbed soils. You are certain to have it growing nearby. It often pops up in my own garden. Generally considered a weed the gardener prefers to kill. Nicholas Culpeper used plantain for consumption of the lungs, consumption being the old name for tuberculosis. He noted it particularly useful for coughs from heat. He recommended drinking the juice for catarrhal discharges or heavy menstruation. Probably leaves although he utilised roots, leaves and seeds. Root he powdered or decocted. Seed he preferred for dropsy, epilepsy and jaundice. Finally, he noted any plantain for healing wounds and sores either applied externally or taken internally. Used today by medical herbalists for its wound healing properties and its soothing effect on the body which includes coughs. Mabey describes a drying action. For wound healing properties he suggests crushed leaves applied directly to skin to stop bleeding. He finds it a soothing expectorant and recommends for many lung conditions. Barker finds leaf of Plantago lanceolata far more useful for pulmonary conditions than the major variety. However, he prefers the major variety for wound healing, benefiting skin complaints such as acne rosacea, and for its diuretic properties, in treating conditions such as cystitis particularly with associated haematuria. I find common plantain or ribwort extremely versatile plants. Plantago has an affinity with mucous membranes. Mucous membranes are throughout the body protecting our digestive, urinary and respiratory tracts. I generally find plantain cooling and soothing so in general I would select this for a prescription where someone may have irritated sinuses or a red raw sore throat. In addition, it makes for a wonderful first aid ointment. A wonderful ally to find immediately after attack by an insect! Rub the crushed, or chewed, leaf directly on insect or bee stings. Mabey notes a combination of silica and tannin make plantain useful in treatment of varicose veins and haemorrhoids. In addition, he adds silica strengthens the lungs. Menzies-Trull discusses the iridoid glycoside, aucubin, as antiseptic particularly for infections of the gastrointestinal tract. In addition he adds antimicrobial saponins, allantoin and the minerals potassium and zinc. He considers the stimulating effect on the immune system attributable to the polysaccharide content. Another herbalist, Chevallier, describes aucubin a strong urinary antiseptic linking with Barker’s cystitis use. Allantoin, he describes, a potent tissue healer. Research supports use in chronic bronchitis and chronic cough. A Bulgarian study (Matev et al, 1982) aimed to ascertain if Plantago major had expectorant and anti-phlogistic (i.e. reducing inflammation and/or fever) actions. They reported favourable results following treatment of 25 patients with chronic bronchitis for a 25 to 30 day period with Plantago major. A German article published in Wein Med Wochenschr reviewed clinical data and confirmed Plantago lanceolata to be anti-inflammatory, spasmolytic and an immune stimulant. They particularly highlighted the use of Plantago for chronic cough (Wegener et al, 1999). I have already mentioned I personally find plantain cooling. Culpeper believed it a herb of Venus. Frawley et al suggests bitterness and astringency combine to give this herb its diuretic action. Furthermore, this combination of bitters and astringency, they find better for a Pitta constitution. These actions cool blood and energy thereby reducing Pitta. Finally, Frawley et al describe plantain a cooling alterative. This plant is native to East Asia predominately Japan, Taiwan and northern China. In its natural habitat it has predator plant louse to keep it under control. Unfortunately elsewhere it has earned the reputation as the world’s worst invasive species. More commonly known as Japanese Knotweed. We so do not need the knotweed! Well those little louse critters unfortunately, are also non-native to the rest of the world too. So Japanese knotweed is causing a whole host of problems. It is outcompeting native flora and a contributor to river bank erosion which increases the likelihood of flooding. In the UK the plant has caused significant delays and cost to development and structural damage. In fact in some cases mortgages have been refused where it has been found in gardens. You can begin to see why we so do not need the knotweed! It is now becoming common in urban areas, on waste land, railways, road sides and river banks. When back in Devon last September I was horrified to find it growing along an estuary where I often went herb walks. In the UK they are attempting to introduce the louse in the hopes of controlling the plant. I have now found it growing on the riverbank here in France, some three kilometres from where I live. Apparently in the Parc de Saint Périer, Morigny-Champigny, Essonne (south of Paris) they are working with goats to control plant growth. I remembered some years back it mentioned in a class or lecture that it did indeed have medicinal properties. Known as Hu Zhang in China. The dried root and leaf are utilised. It apparently has a bitter taste. Energetically described cold and dry. In traditional Chinese medicine it is utilised to eliminate damp heat and for pain relief. Some recommended conditions include rheumatoid arthritis, trauma injuries, bronchitis, pleurisy and other damp heat lung infections. Wild foraged as a wild edible spring vegetable in Japan. Known as Itadori which apparently means ‘pain relieving’. In addition to use as a medicinal in some areas. Constituents include anthraquinones and anthraglycosides primarily emodin. In addition there are tannins and resveratrol. Emodin and resveratrol have shown anti-tumour activity in research. In conclusion it seems highly unlikely Japanese knotweed will ever be eradicated. Resilient to cutting. Roots can be 10 feet down and some 23 feet across. Furthermore even the tiniest piece of root remaining can return. For the moment we so do not need the knotweed. It is hoped a way of controlling this plant is discovered before it outcompetes some of our native medicinals. And causes other damage. Hopefully a way of controlling growth will be discovered. Perhaps then it may well become a useful medicinal ally. Finally, I would advise against use as a medicinal in countries where it is non native. It is probable there is contamination with pesticides in the role of control. Often, on herb walks, people are surprised to discover beech and oak trees are related. Both the beech and oak are botanical members of the Fagaceae family. The scientific name Fagaceae means beech family. Whenever I add a new medicinal plant profile to the blog I include the botanical family and scientific name. That way readers can easily identify other plants within the same family. The plant scientific name generally includes two names, the Genus and the Species. Medicinally it is important you have the correct Genus and often, species. That being said, for some plants similar Species are used medicinally interchangeably. Others not. For example if we look at the lime flower or linden blossom tree medicinal use of three different Tilia species is interchangeable. However, today we discuss some of the Fagaceae or beech family. Are trees or shrubs and either deciduous or evergreen. They have single nuts attached to scaly or spiny caps. Leaves are simple, alternate and often toothed or lobed. Contain varying amounts of tannic acid – astringent and diuretic. The following are some of the more common examples of botanical members of the Fagaceae family with Genus and species scientific names provided. Common names included within brackets. In addition, botanical features and medicinal properties break down further within the Genus and sometimes species too. You can see from the examples below the similarities and the differences between each medicinally. Medicinally utilised historically. However, beech is now generally out of favour. Branches or bark of 2-3 year old branches were utilised. A decoction was brewed as an astringent and disinfectant mouthwash and gargle. Some older sources suggest use as a quinine substitute. Beech nuts, or masts, contain high saponins and an alkaloid called fagin. Therefore, in quantity, they can make you feel unwell although pigs seem to thrive on them. Horses are particularly susceptible to beech nuts. Beech nuts are becoming quite popular in wild foraging courses. Remember not to eat in quantity and perhaps avoid if you are prone to an upset stomach. Leaves, bark and the nuts of the sweet chestnut can be utilised. Leaves are expectorant and sedative. Historical use of leaves for coughs particularly whopping cough. In addition also for dandruff. The bark is antidiarrhoeal and febrifuge. Therefore, traditionally utilised for dysentery. As we know chestnuts are nutritious eating. Another popular find on a wild foraging course. Traditionally decocted for mild diarrhoea. Finally the oaks. There are lots of different oaks within Europe. As a result of my living in one of the largest wine regions in Europe a mention of oak in the wine making industry is pertinent. Wine makers prefer sessile oak (Q. petraea) for casks. While the peduculate (Q. robur) is preferable for cognac. However, the sherry makers choose the Portuguese oak (Q. pyrenaica) for their casks. Finally, last but not least, one needs a cork for that wine bottle, not a nasty screw top, and that is from the cork oak (Q. suber). Pedunculate and sessile are the native oak trees in the UK. The medicinal uses of these two species are interchangeable. The dried inner bark and dried leaves are medicinal. Medicinal use, as with most of the Fagaceae family, is predominately externally. Traditionally used topically for haemorrhoids in an ointment, or in a lotion for cuts and abrasions. Also used as a douche for leucorrhoea or a gargle for tonsillitis and chronic sore throat. The gargle use similar to the beech above. Internally both oaks were used, like sweet chestnut, for dysentery. In addition, Maud Grieve recommended as a quinine substitute, again a similarity with beech. The above gives an indication into the benefits of learning a little about a botanical plant family. Furthermore, in the above example, you can clearly see some similarities within the botanical members of the Fagaceae family. In conclusion, medicinally, this is largely due to the astringency (tannins) generally toning and beneficial for conditions ranging from sore throats to diarrhoea. Over the springtime I am frequently asked about plants for wild foraging. Free food foraging of wild edible plants is a popular pastime. Naturally my main interest lies in the medicinal properties of plants. However, often there is overlap where these plants have nutritional virtues. Wild flowers in foraging recipes may be added for nutritional value, colour or texture. Some more common wild foraged foods such as dandelion many have heard of adding flowers, or particularly leaves, to a salad. The leaves are rich in potassium. A favourite diuretic herb of many herbalists. There is a reason the French common name is pissenlit! Also well-known, the humble nettle. A great spring time tonic whether prescribed by a herbalist, added to soups or cooked similarly to spinach in a recipe. I have added a wild foraging tag. Although these are not, strictly speaking, wild foraging posts some such as elderflower and red dead nettle include forage recipes. Common sense must prevail. Be a courteous and cautious forager. Check out the rules of your own country. Ensure you have the correct plant. If even the slightest doubt, leave it. Never pull roots. Take care where you gather plants from. Most importantly free food foraging of wild edible plants is fun, a popular pastime so, enjoy! Elderflower Cordial, Wine or Liqueur ? rflower Cordial, Wine or Liqueur ? Elderflowers are in full beautiful bloom. My mind is currently a spinning wondering what delicacies I can make. Do I opt for more tincture or elderflower cordial, wine or liqueur? Incidentally I cannot abide the smell of elderflowers. In saying that, they are still one of my favourite trees to see in bloom at this time of year. The medicinal virtues far outweigh my dislike for the smell. Earlier in the month I posted a basic tincture recipe. An easily adapted recipe for other medicinal plants. However, I suggested collecting and drying elderflowers. Ideal to keep as a winter tonic to boost immunity or a hay fever tonic for next spring. Now I am wondering should I make elderflower cordial, wine or liqueur? Non alcoholic versus alcoholic I hear you ask? And so on to my dilemma. Anyone knowing me, or even following my blogs, know I LOVE books. So pondering what to do with all the beautiful elderflowers I turned to one of my books – The Drunken Botanist by Amy Stewart. My best friend Sharon has always enjoyed a Sambuca after a meal. She believes it helps her digestion. Sambucus nigra is the scientific name for the elderflower tree. Although this thought had crossed my mind I did not realise any part of the plant was an ingredient. Anyone having tried Sambuca will probably agree it is a more aniseed based flavour. However, in The Drunken Botanist, Amy explains that although artificial flavours and colours are occasionally used some black sambucas actually owe that deep purple-black colour to the crushed skins of the elderberries. So there we have it. Everyone loves a bit of elderflower wine or liqueur. But you don’t always want the alcohol. Sometimes you have to work, write blogs or prepare herbal events! Amy’s elderflower cordial sounds absolutely delicious. One obvious difficulty for me is she recommends gathering those fresh flowers on a warm afternoon when THAT fragrance is strongest. Oh dear! Author NicolePosted on 1st June 2017 3rd July 2017 Categories Herbal Fables and AnecdotesTags just for fun, Medicinal Trees, Wild Flowers, wild foragingLeave a comment on Elderflower Cordial, Wine or Liqueur ? Tilioideae (formally Tiliaceae) Tilioideae is a sub-family of Malvaceae. So is it a linden blossom or lime flower tree? Both names appear to be used interchangeably. One thing for certain it is not a citrus tree and bears no edible lime-like fruit. It is however a very beautiful tree and definitely one of my favourites. Scientifically there are several species. The small-leaved lime, Tilia cordata, grows up to a height of 30m. Tilia platyphyllos, or large-leaved lime, grows up to a height of 40m. Tilia x vulgaris and Tilia x europaea are both applied as scientific names for common lime. The common lime is a naturally occurring hybrid between the small and large-leaved lime. All the above are used interchangeably medicinally. In English you may find the common name written as large or small-leaved or common linden blossom or lime flower. Mills (1993) advises there is a difference in leaf size between the species but no known differences in therapeutic activity. The leaves often described as heart-shaped are occasionally slightly asymmetrical at the base. The dried flowers are used in an infusion with one teaspoon of the herb per cup of boiling water. Two to three spoonfuls are recommended in cases of fever (Hoffmann). Mills (1993) recommends 1 to 4g of flowers three times a day. Mills (1993) advises the tree is found throughout the temperate world growing in large parks, gardens and in the wild. He recommends drying the flowers quickly after picking as they spoil quite easily. Barker notes bark is sometimes used though adds externally as an anti-inflammatory poultice. Fresh leaves can be eaten. He advises harvesting early in flowering for medicinal use. A popular infusion in France and often found dried for sale at French markets. Trees frequently found in France in school playgrounds or village squares. Believed to be popular in these areas to promote relaxation. This tea almost immediately makes me feel calm and very relaxed with a most pleasant, warm and comfortable feeling. I like the taste which I would describe as a combination of light, sweet, floral and with a subtle fruity, slightly astringent flavour. This wonderful tree has countless examples of traditional use. The wood was used for detailed carvings. Easier to work with than other woods particularly for minute detail. Traditionally popular for detailed carvings. Reputedly there are many lime wood carvings in St. Paul’s Cathedral in London and in Windsor Castle. Apparently the lightest wood produced by any European tree and said to never get woodworm. Used for clogs and cuckoo clocks as well as musical instruments. Also used in sounding boards for organs and pianos. Honey is produced from the flowers (Grieve). Bartram advises once utilised to reduce severity of epileptic seizures. While Ward (1936) noted it a popular remedy for chronic catarrhal conditions following colds. Given for nervous headaches and hysterical tendencies. Recommended as an infusion of 1 drachm in 1 pint of boiling water or in bed-time baths, in equivalent strength, for those suffering from insomnia. Even today many herbalists utilise lime flower for insomnia. Mills (2001) indicates lime flowers for any acute infections particularly if accompanied by fever. Thus indicating common colds, bronchitis and influenza. Further described as being antispasmodic and relaxant and indicated for anxiety, intestinal colic, irritability, restlessness and sleeplessness and tension headaches and migraines. Barker suggests combining with Elder for the common cold with fever. In addition, he recommends with Hawthorn and Yarrow for poor peripheral circulation. Furthermore, like Mills, he recommends for headaches and insomnia from nervous tension. Finally he combines with hawthorn for hypertension (high blood pressure). I have often combined hawthorn and lime flower in herbal prescriptions. Hoffmann advises use as a prophylactic particularly for arteriosclerosis and recommends it specifically in the use of high blood pressure with arteriosclerosis. He recommends combining it with hops for nervous tension. Mills (2001) describes lime flowers as a herbal aquaretic meaning the herb is a diuretic that excretes water from the body. He recommends its use as a decoction for hypertension. Herbal aquaretics benefit in replacing potassium lost through the use of modern diuretic prescriptions. Recommended for phlebitis and varicose veins. Believed to have a restorative effect following auto-immune attacks such as arteritis, a condition involving inflammation of artery walls. One of the first herbs of choice, along with chamomile, for illness in babies and children (Mills, 1993). Listed active ingredients, for medicinal purposes in phytotherapy, are flavonoids, volatile oil and mucilage components (Toker et al, 2001). Mills (1993) advises lime flowers contain flavonoids, mucilage, saponins and tannins. The volatile oil includes farnesol. Flavonoids predominately work on the vascular system. However, they are usually diuretic and some may well be anti-inflammatory, antiseptic and anti-spasmodic. Saponins will also work on the vascular system. He describes these two constituents as having a synergistic effect on the blood vessels. Mucilage protects against infections and neutralises toxins while tannins astringe membranes making them less sensitive to bacteria. Some saponins also have an effect on the female hormone system and can regulate steroidal activity. Farnesol in volatile oil is anti-inflammatory, bacteriostatic and deodorant (Clarke, 2002). Weiss (2001) describes a study conducted by two paediatricians on children with influenza type symptoms. The children on lime blossom tea and bed-rest recovered much more quickly and with fewer complications than those given orthodox medications. I particularly like lime flower for children. It is quite possibly one of my favourite herbs for them. I did read a review of scientific evidence sourced into linden blossom absolute on an aromatherapy site some years back. Inhalation experiments tested essential oil of Tilia cordata and two of its components, benzaldehyde and benzyl alcohol. T. cordata produced a significant decrease for traditional indications such as headaches, migraine and anxiety. In conclusion use is justified in aroma-therapeutical applications. The quoted study was from 1992, Arch. Pharm. Apr. 325(4):247-8. Energetically, linden blossom or lime flower has a warm temperament (Mills, 1993). While Holmes describes linden energetically as a bit pungent, sweet and astringent. In Ayurvedic energetics he describes it as decreasing Pitta and Kapha. Furthermore, he finds it beneficial for several conditions. External wind heat includes fever and unrest. Other indications include lung wind heat which covers thirst, dry cough, red sore throat. Both lung wind heat and external wind heat cause irritability. Headache and nervous tension are kidney Qi stagnation. This beautiful little flower is a welcome sight in my garden at this time of year. Flowering is from February to May (Barker). The photos here taken in my own garden in February. So why the title “may violets spring”? Sweet violets do make me think spring is near as they spring up so early in the year. However “may violets spring” is from Shakespeare. Any reader of Shakespeare, or Hamlet in particular, may remember this on the death of Ophelia. Sweet violet is a flower many will know. They prefer growing in damp woods or shady spots. In my own garden they are flourishing under a tree. Leaves heart shaped. In herbal medicine leaves either fresh or dried. However, flowers preferred fresh. Harvesting during flowering. Barker adds the rhizome can also be utilised but points out underground parts are stronger and are more likely to provoke emesis. I have personally only ever utilised aerial parts. Early in flowering, leaves and flowers make a pretty addition in a wild foraged salad. The following excerpt is from Harold Ward’s Herbal Manual. Remarkable claims have been made for violet leaves in the treatment of malignant tumours. The case of Lady Margaret Marsham, of Maidstone, was reported in the Daily Mail for November 14th, 1901. This lady, suffering from cancer of the throat, used an infusion, which was left to stand for twelve hours, of a handful of fresh violet leaves to a pint of boiling water. After a fortnight of warm fomentations with this liquid the growth was said to have disappeared. The same newspaper, under date March 18th, 1905, told its readers that violet leaves as a cure for cancer were advocated in the current issue of the Lancet, where a remarkable case was reported by Dr. William Gordon, M.D. Such accounts as these, although interesting, should be read with considerable reserve. Barker suggests interest in Viola odorata has maintained due to the plants reputation as an anti-neoplastic. Indeed in more recent years, research has found a cyclotide from Viola odorata to have antitumor effects. Research in this area continues. Viola odorata has a strong affinity with the respiratory system. Mabey (1988) suggests the combination of saponin and mucilage make Viola odorata a soothing expectorant. It has a cooling nature used for hot headaches and feverish colds. Finally he adds the mild sedative nature makes it useful where there is accompanied insomnia or anxiety. Tobyn (1997) notes sweet violet will cool over-heated lungs. Barker (2001) describes it has having expectorant action useful for cough but finds it soothing rather than sedative. I would tend to agree myself and believe it soothing rather than sedative. Menzies-Trull agrees it is a demulcent expectorant. He also highlights Viola as an anti-neoplastic particularly for malignancy of breast and intestine. Under the dominion of Venus, and utilised by Culpeper for purging the body of excess choleric humours. Leaves, he reported, stronger for this purpose although flowers also used. The choleric humour is hot and dry. Menzies-Trull adds it moderates anger. Anger is generally, like the choleric humour, heating. Viola odorata is cold in the 1st degree and moist in the 2nd degree and under the dominion of Venus (Tobyn, 1997). Culpeper prescribed this as a cooling cordial. Today this herb described as emollient (Barker, 2001) confirming its traditional moist attribute. Violets may see the start of warmer weather. However, the humble little “may violets spring” is definitely a soothing, cool friend. Barker describes purslane as a creeping annual which can spread from 10-30 cm. The end of the stems are much leafier. Here you may find a few yellow flowers. The leaves are waxy and smooth. It is often an escape of vineyards in France especially in the south and east. Easily tolerates poor soils and drought. The name is believed to derive from the word ‘porcelain’. Culpeper advised it could be used as a salad herb. Good for cooling heat in the liver, blood and stomach. He described the seeds as more effective than the leaves particularly where there was heat and sharpness in the urine. The seeds he advised, should be bruised and boiled in wine and given to children to expel worms. Purslane seemed also to be considered a contraceptive! Culpeper added it would extinguish the heat and virtue of natural procreation. Bruised herb was applied to the forehead for any excessive heat hindering rest and sleep. Application to the eyes, or any wheals and pimples, reduced redness and inflammation. Bruised leaves mixed with honey and laid on the neck would take away pains and a crick! The juice too was used. This Culpeper particularly recommended to stop vomiting or, mixed with a little honey, for an old, dry cough. Juice was advised for inflammations of secret parts of man or woman! Finally he advised application on gout where it would ease pain so long as the gout was not caused by cold. The leaves contain high amounts of Vitamin C. Used as a remedy against scurvy (Barker). Holmes notes appreciated for millenniums and traditionally used in Europe for thickening soups and stews and hot-pots. He believes it the Western equivalent of okra, or lady’s fingers. and the Book of Experiences. Barker notes purslane is used as a salad herb around the world. He also describes it as cooling. As an emollient it has a vulnerary action on the skin. The leaves are mucilaginous and diuretic providing a soothing action on both digestive and urinary tracts. Like Culpeper, Barker too describes the seeds as vermifuge though gentle enough for children. Holmes, like Barker, notes the Vitamin C content. He adds some minerals and omega-3 fatty acids. Holmes lists several indications for purslane. He describes it a moist, cooling, demulcent herb. His indications include painful boils, carbuncles, localised purulent infections, chronic loose stools with blood and pus, frequent burning bowel movements, intestinal parasites, burning urination and thirst. As a vegetable he recommends eating raw, lightly steamed or pickled. Not surprisingly, due to the obvious cool nature of purslane, Culpeper ascribed it a herb of the Moon. He recommended purslane for all hot, choleric conditions. Holmes discusses it energetically as clearing toxic heat, blood heat, intestinal damp heat and bladder damp heat. This little purple annual tricks us into thinking she is a cousin of the stinging nettle. Even the common name suggests this. 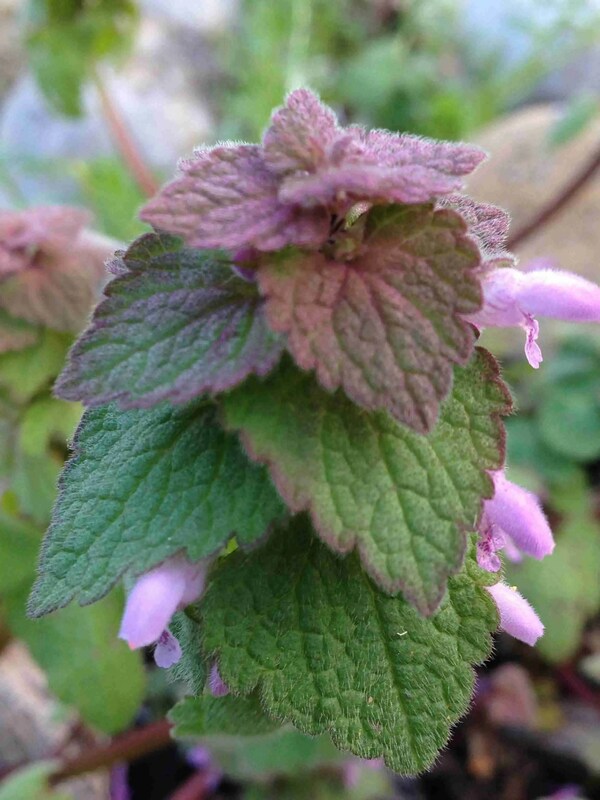 Lamium purpureum has no sting and is actually related to mint and thyme. The common name and Latin name disagree too on the colour. Are the heart shaped leaves red or purple tinged? It is a fairly common annual starting from seed every year. Typically found flowering between March and October. Found growing year round in milder climates. This particular plant photographed in the Aude in February. Unfortunately, red dead-nettles are often dug up or pulled out of gardens. The bees love them! Lamium purpureum does not have as many documented medicinal uses as Lamium album (white dead-nettle). However, Mrs Grieve advises leaves and flowers are a useful decoction for haemorrhage. Barker lists styptic and astringent as medicinal actions. Both, Grieve and Barker, recommend the tea for ‘a chill’ suggesting a febrifuge action. 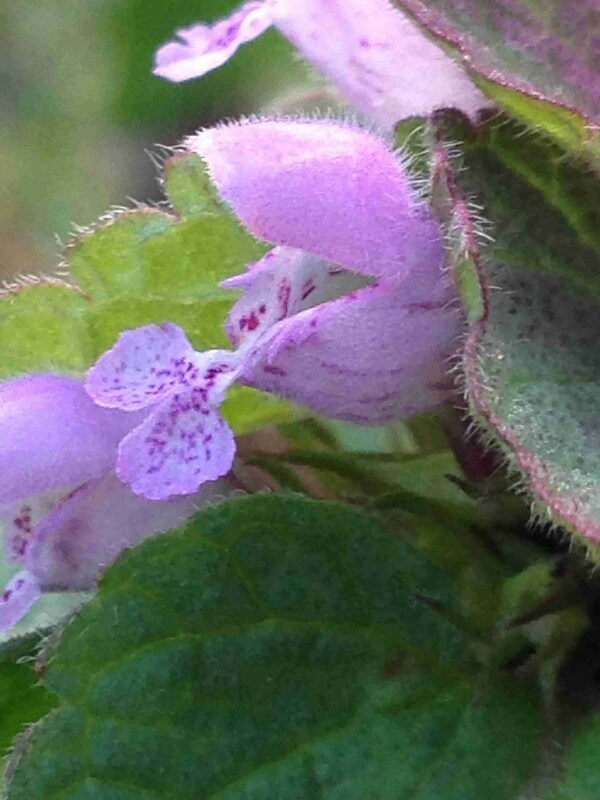 Susun Weed uses Lamium purpureum leaves and flowers in two different salads. One she calls a green salad. The green salad includes leaves of chickweed, garlic mustard and dandelion. The other is fairy salad. Sure to look gorgeous as it includes violet, periwinkle and dandelion flowers.